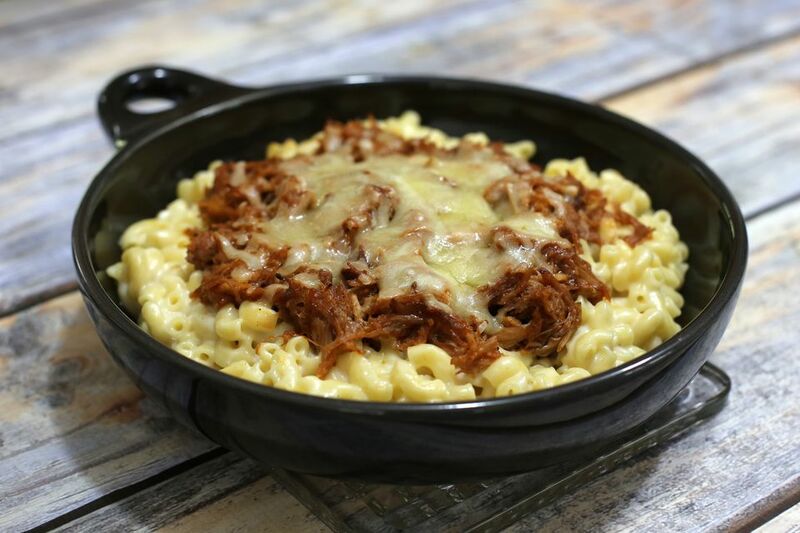 We all love to eat pulled pork with macaroni and cheese on the side, but have you ever thought about mixing them together? This recipe combines the two comfort foods to make an incredibly tasty casserole. Whether you use purchased pulled pork or your own homemade leftovers, this casserole will quickly become a family favorite. Serve this casserole with homemade coleslaw and biscuits or soft rolls. You can substitute pulled chicken, pulled ham, or shredded beef for the pulled pork if you like. Cook the macaroni in boiling salted water following package directions. Drain and rinse in a colander. Heat the oven to 350 F (180 C). Butter a 2 1/2- to 3-quart baking dish. Meanwhile, heat butter in a saucepan over medium heat. Add the flour and continue cooking for 2 minutes, stirring or whisking constantly. Gradually add the milk, whisking to blend thoroughly. Cook, stirring, until thickened and smooth. Stir in the ground mustard, salt, and freshly ground black pepper. Add 2 cups of sharp cheddar cheese and cook, stirring, until melted. Combine the drained macaroni with the cheese sauce, blending well. Heat the pulled pork on the stovetop or in the microwave until hot (or as package directs if you use purchased). Spoon the macaroni and cheese mixture into the baking dish. Top with the pulled pork. Sprinkle the pulled pork with the remaining cheddar cheese. Bake for about 20 to 25 minutes, or until the casserole is hot and the cheese has melted. Freeze leftover pulled pork so you'll have it whenever you need a quick meal. To speed up making the bechamel (the butter/flour/milk white sauce), use warmed milk and add it gradually as recipe states. If you like Tex-Mex flavors, add some chopped jalapeno and/or mild chopped green chili peppers. This will go nicely especially if you top the casserole with the Mexican cheese blend. Mix in some chopped jalapeno and/or mild chopped green chili peppers. This will go nicely especially if you top the casserole with the Mexican cheese blend. Feel free to use other pasta shapes such as penne, shells, or rotini. If you add a vegetable such as broccoli or peas this will be a one-dish meal. For a crispier topping, sprinkle on some breadcrumbs with the shredded cheese.